Yesterday was the day I dreaded ever since I heard the doctor say right after surgery that Bennett had been given a colostomy. Yesterday was the day, five days after surgery, Bennett learned he has one. Bennett has continued to heal. They were able to remove his foley yesterday so he is now able to pee on his own again. Bennett was also able to move from IV pain meds to oral pain meds of Tylenol/Motril. 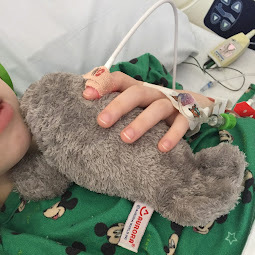 Instead of IV fluids, he is getting fluids through his g-tube. He is now pretty much unplugged from everything that would keep him in the hospital. I am hoping we will be discharged today. 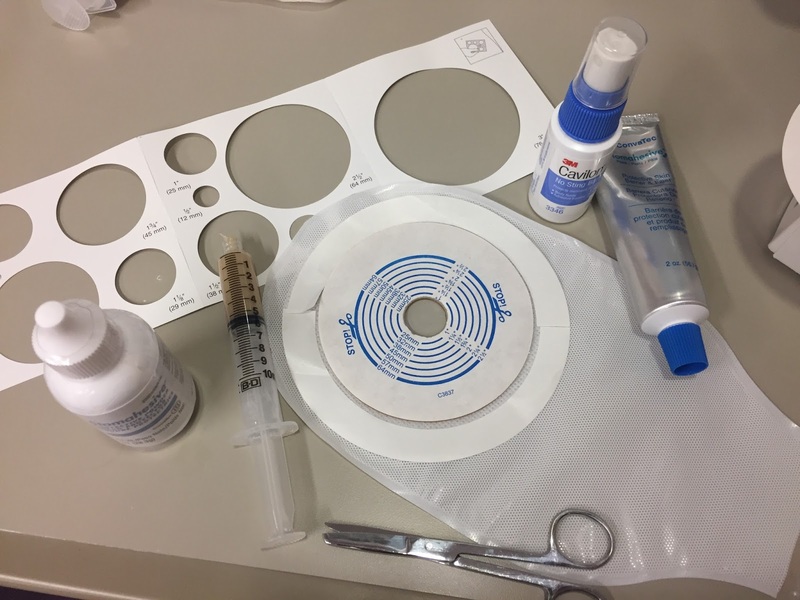 But, besides the typical "being unhooked from machines" and "eating/peeing/pooping" that is required to be given the great light to go home from the hospital, there was one more thing that we have had to do this admission before getting permission to go home: demonstrate proficiency changing Bennett's colostomy. So, yesterday afternoon, while Brian took Avonlea and Oliver on a scavenger hunt around the hospital, Katie, a soft spoken Child Life Specialist at Children's came to talk to Bennett and me. I sat at the end of Bennett's hospital bed. Katie knelt down on her knees next to his bed. I didn't even know where to start so I let Katie take the lead. Katie said, "Bennett, do you know why you came to the hospital?" Bennett, surprisingly interested in conversation with Katie nodded and said, "to fix the tiny hole that my poop was going through"
Katie nodded, "yes, and did you know that sometimes, when kids come to surgery, doctors have to make it so that parts of their body rest?" Katie said, "yes, and sometimes when the doctors do this - when they need the bowels to rest - they put in an ostomy. Do you know what an ostomy is?" Bennett shook his head no. Katie said, "an ostomy is a bag with a special sticker that sticks to the side of your body...it's where the poop can come out while the other parts of your body rests for a while." Bennett seemed mildly interested and said, "oh" as though he had learned something new for the day. Katie paused...a pause that felt like it took forever. But I reassured myself Katie's pause was important. 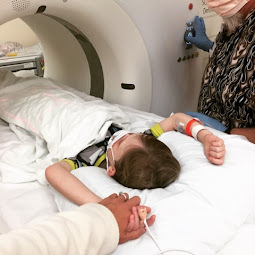 Just two days ago, our CF psychologist and a psychology intern had come to visit Brian and myself and to answer questions we had about telling Bennett about his ostomy. One of the main take aways I took from our conversation was this: don't give a child more information than they are ready for. Let them ask questions. Katie waited to see if Bennett would ask a question. Bennett did not. Since it was really important that we have this conversation with Bennett, Katie went on and asked, "And, Bennett, did you know *you* have an ostomy?" In bewilderment, Bennett said: "I do??" Bennett's next question was, "does it hurt?" Katie replied, "not usually but maybe at first." Katie showed Bennett an example of an ostomy bag in case he wanted to touch. He did not want to. Bennett asked if the ostomy would always be there. Katie said, "that's a good question. We can ask your doctor." At one point during our conversation Bennett began to tear up. At that point, I did too. I think we were both feeling scared. After a little bit more time, Katie asked if she could invite an Ostomy Nurse in to the room to show Mom how to change his ostomy. Bennett agreed. The ostomy nurse came in and was very sensitive to our situation (in fact, everyone has been - not one nurse or doctor or resident or fellow said one word to him about his colonstomy - every single person respected my wishes that we wait until Child Life could tell him - I was and still am incredibly grateful and impressed with a desire from everyone that Bennett be told in an age-appropriate and time-appopriate way). The ostomy nurse started by asking Bennett if we could move his toys he had in front of him out of the way so that she could get to his colostomy to remove and replace it. He agreed but grabbed a toy, one that was big enough to block his eyes from having to watch what she was doing. I didn't realize notice how the toy was being used by him to block his view until we started really messing with his colostomy. But it became apparent at some point that he didn't want to see what we were doing. That was fine. Nobody asked him to look. The process of cleaning/removing a colostomy bag involves pulling away the bag which is stuck to the skin and cleaning the area. This was *tremendously* painful for Bennett considering he just had abdominal surgery. After that, the nurse cut the bag down to the right size, placed a spray that acts as a skin barrier, put glue on the sticker of the bag and placed the bag in the right position. This was a familiar process to me since Bennett had an ileostomy at birth. But I appreciated the refresher. Before the nurse left, she explained to Bennett that he can do anything with an ostomy that anybody else can do - he can run, play, jump and even swim. This seemed to really help Bennett feel better. 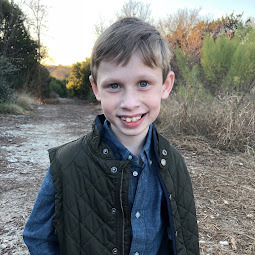 Once we were done changing out Bennett's colostomy and Bennett felt better, I asked Bennett about telling Oliver and his Dad: "They live with us so they are likely going to see your colostomy at some point. Would you be interested in having them come in and learn about your ostomy so they can ask questions to you and Miss Katie?" Bennett surprised me again with his cavalier response, "oh sure." Within a few minutes Oliver and Brian filed in to the hospital room. Oliver was very laid back when hearing about Bennett's colostomy. Katie explained that pooping in to a bag seemed weird but really wasn't. She said, "some kid's bodies just need things to work a little differently." At one point, Oliver explained Bennett's stoma looked gross." Katie very gently explained that the pink part he was referring to is Bennett's intestine on the top of the skin and the black part is the poop. 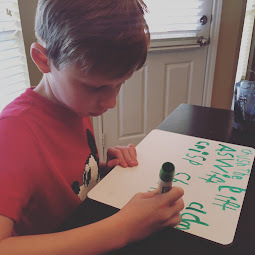 Oliver asked a few more questions like, "Why is it round? I thought the intestines were a cylinder" before both the boys' interests waned and their conversation dissolved into potty humor. I felt like our conversation with Bennett went really well overall. I shared with Oliver later that Bennett's ostomy is a private thing and that we shouldn't talk about it without asking for his permission first. ...I do understand the irony of my statement since I am writing about Bennett's colostomy on his blog. But my hope is sharing about it will help others better understand all that Bennett (and our family) has been and is going through. I trust that any conversations Bennett has with his peers about his condition will be done on his own terms. I realize I am taking a risk by putting Bennett's story - our family's story - out there. But Brian and I have talked much about this and believe that, at this time, sharing our situation is the right thing to do. If, at some point in the future this changes, we will response accordingly. My deeper belief is that if people better understand one's condition, they can be more compassionate and understanding. I believe this with children as well. I have no doubt that Bennett will, in some capacity, choose a close friend to share this information with at some point. And when he does, we will help coach everyone involved on how to respond. There's nothing to be ashamed about if you have CF or issues with your GI system or if you need a colostomy. Lots of people do, through no fault of their own. Brian and I have thought a lot about whether or not Bennett will go back to school with his ostomy. If, like the nurse said, a child with an ostomy can do everything anyone else can do, then why not? But, we haven't made any decisions. Bennett needs time to heal physically and emotionally. For now, future decisions are on hold. Late last night as I was lying down to rest for the evening, Bennett complained of a burning on his back. I came to his bedside to investigate. What I saw was poop from his colostomy bag was leaking and rolling down his back. I contacted the nurse who agreed with me that we would need to change his ostomy bag. It was such a shame. Colostomy bags are made to last 24-48 hours as changing them often can irritate the skin. 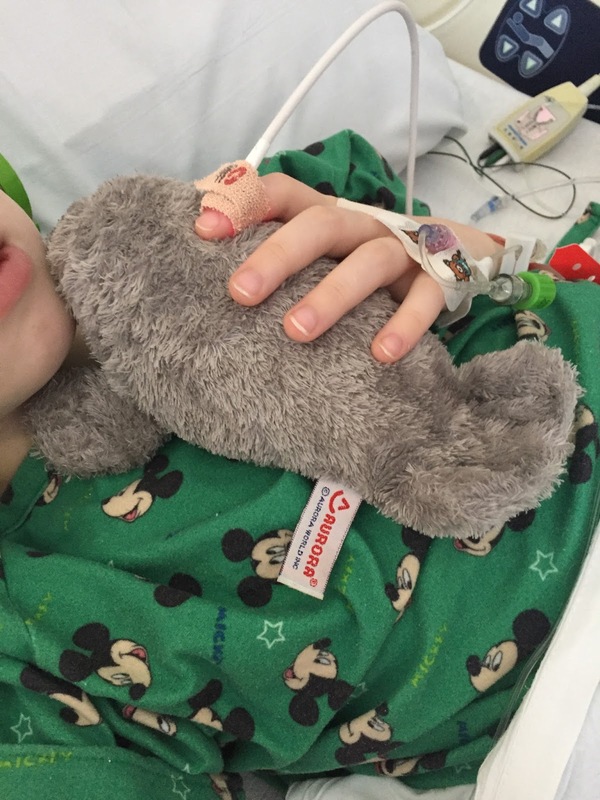 But, now, Bennett faced having to have two colostomy bag changes in less than 6 hours. I asked the nurse if I could change Bennett's ostomy since I was supposed to change it with the ostomy nurse in the morning one more time before we go home. The nurse agreed to allow me to change it with her coaching. As I expected, it was relatively easy and straightforward to do. What I had not expected was exactly how painful it was going to be for Bennett, especially considering the ostomy crosses his incision line and requires gentle pressing on his very sore tummy.. Bennett screamed in pain the entire time. It was very hard to watch. I felt like he couldn't get relief because cleaning the ostomy requires so much manipulation of the area. It made me SO sad for him. Even as I was doing it, I remember thinking how unbelievable it is to watch this child continue over and over and over to experience these painful situations. "Why, God, do you allow this, especially of a child?" I prayed in my head, knowing I will likely never have a sufficient answer to this question. Once the nurse had gone, I lied with Bennett as he tried to calm down. We just lied there processing how he was feeling. Through sobs, he explained how badly it hurt. I apologized again and again. I just tried to reassure him I was with him and doing everything in my power to make it better. I said, "Bennett, I want you to know none of this is your fault. Nothing you have done has caused this. You have done everything right. It's just your body that is broken." Bennett tried to catch his breath and then wept more, "I don't know how to fix it." "Fix what? " I asked, "your colostomy? your CF?" He said, "all of it." Combing my fingers through this hair, my own tears streaming down my face, I said, "I don't know how to fix it either, buddy." I think we all wish we knew how to fix it. ((hugs)) You are in my thoughts constantly. I greatly appreciate how you share your family's story. I'm honored to witness and send love along the way. Hard not to cry with you. I am learning so much from you about how to be in the moment, humble, open, and brave. Though he may feel unlucky, he is so lucky to have you as his mom. Blessings friend. You Are Amazing! Thankful that you have such sensitive and skilled support around you, and, you are surrounded in prayer by so many. Love to all of you!